It's a Woodstock thing - Stop staring and start sewing! In honor of the 40th anniversary of Woodstock I took my hippie skirt and turned it into a hippie shirt. I've had this skirt for probably ten years and I think I've actually worn it once (it ended up looking better on the hanger than on me). But I really like the look of it. The nubby fabric, the cotton crocheted lace, the ruffle. All cute. So I found a way to redeem it. I cut the waistband into two strips, each about 18" long. I left 1/2 inch of the white fabric on them to use as my seam allowance when I reattached it. 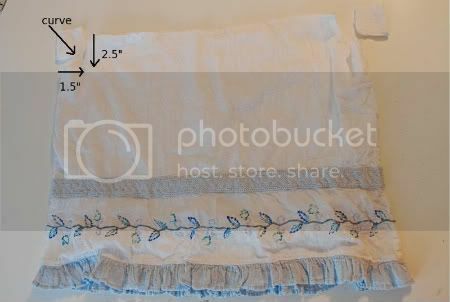 Then I cut the bottom of the skirt about 17.5 inches long (including the ruffle). I stay-stitched around the top because this skirt actually has two layers (a light cotton lining is under the outer layer). I cut the armpit curves at the outer edge of the skirt bottom. 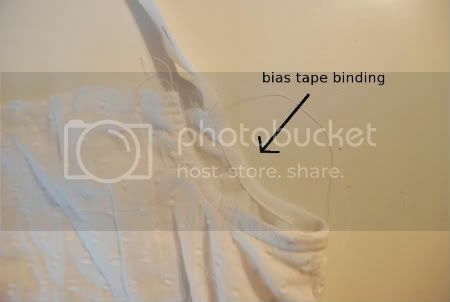 Then I bound it with some narrow bias tape (I just used a small length I had in my bias tape drawer (it was quicker than making my own). 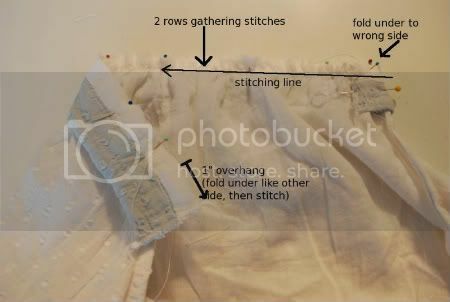 Okay, I made two rows of gathering stitches across the top of the skirt pieces (both front and back) then pulled them up so they were about 1" shorter (on each side) than the waistband pieces. Then I folded the ends of the waistband pieces under so the I can flip them around when they're stitched (I sure hope this makes sense!). 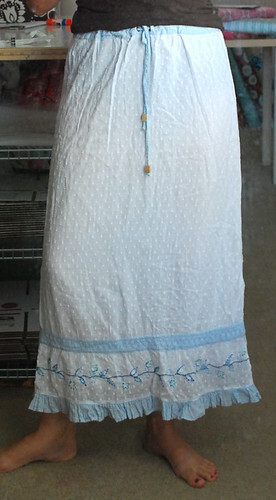 I stitched across the whole thing using 1/2 inch seam allowance. This is what it looked like after stitching and then serging the seam allowance. The end of the straps just get pinned in under those end "flaps" (sandwiched between the layers) then I stitched through all of the layers, encasing the ends of the straps there. 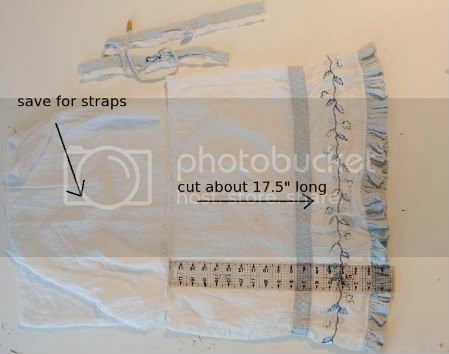 To make the straps I used the excess white fabric (the top of the skirt) and cut 2 pieces 3.5 x 13.5 inches long. I folded each long side under 1/4" and then folded the whole length in half and stitched it closed along the whole length. 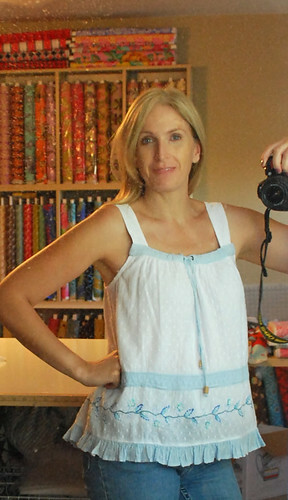 I pinned them in place and then tried it on a couple of times before I sewed them in place. So here is my hippie top and I love it (sorry for the dirty mirror)! Light and breezy (and no bra strap "peekage"). 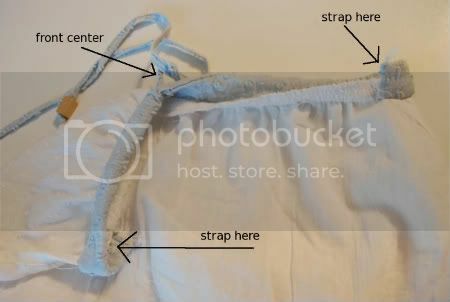 I left the drawstring intact and now I can cinch up the front a little bit. This is going in my suitcase for my Portland trip! I feel so much more productive after making this! I hope you're having a wonderful weekend and getting some sewing done (even just a little)!